DETAILS: Lake views, two 70” flat-screen televisions, and a private heated pool make “Forever House” the perfect spot for your next coastal getaway! This stunning Miramar Beach home offers 5 bedrooms, 4.5 bathrooms, and gorgeous accommodations for 14 guests. Shiplap walls, whitewashed wood floors, and soft neutral décor tones create a relaxing ambiance on the home’s main level. A spacious open floorplan joins the dining, kitchen, and living room areas, and large windows surround the space and allow guests to enjoy abundant natural light. Two full-size refrigerators make room for all of the groceries you’ll need for a week at the beach. Stainless steel appliances, white countertops, and driftwood-colored cabinetry complete the incredible features of this gourmet kitchen. Ample guest seating is available at the breakfast bar and the nearby dining area. Plush furnishings and a large, mounted flat-screen television in the living room create the perfect place to relax after a long day of fun in the sun. Also on the first floor is a queen bed guestroom and a private en suite bathroom with a shower. A secondary living area on the second floor boasts ample guest seating and a large, mounted flat-screen television. Guests can choose from a variety of sleeping accommodations on this level, including two beautiful guestrooms, each with a plush queen bed and access to the shared bathroom. The nearby bunk room is the perfect place for younger guests, with two built-in twin-over-twin bunk beds and a shared bathroom. Two master bedrooms, each with a king bed offers private en suite bathrooms with a dual-sink vanity and a shower. Guests in the master suite will enjoy an exquisite king bed, an en suite bathroom with a shower and a dual-sink vanity, and a private balcony with beautiful lake views. This home is conveniently equipped with two sets of washers and dryers—perfect for a large group of guests—and a commercial-grade ice machine in the garage, which simplifies prepping coolers for a day at the sugar white sand beach. The stunning outdoor oasis will be a favorite spot in this home, and the private, sparkling pool offers lake views and can be heated from October to May for an additional fee. Guests can enjoy a walk to Surf Hut for tacos or take a breezy ride on the home’s 6 custom 360 Blue beachcruiser bikes to explore Baytown Wharf and harbor walk. “Forever Home” promises a week of relaxation and luxury for your next getaway. Book this incredible home by contacting 360 Blue today! Parties, weddings or events held at the property must be pre-approved in writing by 360 Blue. Otherwise, guests will be subject to fines. This property is gorgeous. It is everything you would want in a vacation home and more. The decor is just perfect and so comfortable to enjoy each space throughout the home. There are two very spacious master bedrooms upstairs that have beautiful on suite bathrooms. The bunk room is situated perfectly between the other bedrooms upstairs and all set to go for a group of kids to enjoy their own space. The kitchen was very well thought out to entertain and eat in or grill at the home if you desire. It has two extra large refrigerators to accommodate plenty of food and drinks, with an extra ice maker in the garage. There is a nice pool on the deck to relax and enjoy a drink after the day golfing or at the beach. Destin has the most amazing beaches we have ever been to. It is just a quick walk with the wagon and cooler provided and a must do! The sand is like white sugar and the water is a beautiful sea blue/green that you can see your toes while in it. There are great beach restaurants that you could either walk to on the beach or take the beach bikes that are provided at the house. The Winn Dixie grocery store is less than a mile from the property which makes it so convenient to stock both refrigerators. The steamed shrimp at Winn Dixie is a must !!! We felt truly relaxed and at home here and will definitely come back! We could not be more thrilled to hear how much you enjoyed your vacation with us at this amazing home! We agree that there is so much to love about this home and location it is tough to beat! Thank you for staying with 360 Blue, we look forward to seeing you again soon! This house was very nice!! The heated pool was a plus because it was chilly in Destin. The only downside was not being able to check in a little early because we arrived in Destin 2 hours before check in. What a beautiful house! Huge dual masters and big bedrooms. The deck was perfect after a day of golfing. Very short walk to the beaches and a wagon to pull the chairs and the cooler in. They even have a ice machine in the garage to fill the cooler with. They thought of everything with this house and can’t wait to go back next year!! We are so delighted that you and your group enjoyed your stay with us in Miramar Beach! We completely agree that this home is perfect for a stress-free getaway, and the owners have definitely thought of everything to make it so! Thank you for staying with 360 Blue, we hope to see you again soon! This is a beautiful home. The designers thought of everything. From the double refrigerators, to two sets of washer and dryers, and the full size ice maker in the garage to fill the beach coolers, it is perfect. We loved the bikes and the beach is just a few steps away. It is a must see home and great place to make memories with your family. 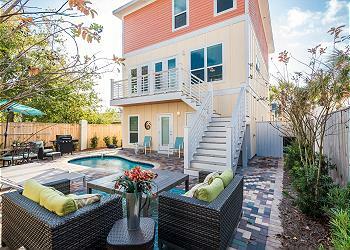 A great rental in beautiful Destin. We will be back. We could not agree more about how wonderful this house is in Miramar Beach! The accommodations are absolutely amazing and the location is perfect! Thank you for staying with 360 Blue, we hope to see you again soon!